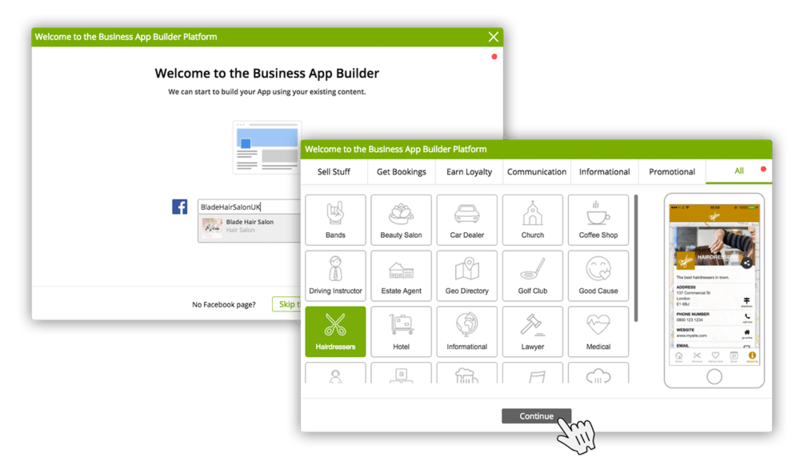 App Builder Features - What Does Appinstitute's App Maker Offer? 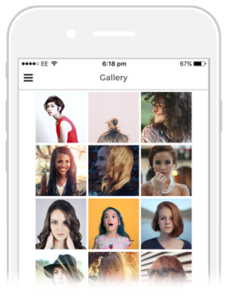 Customise your app with our easy to use app builder and discover our powerful mobile marketing tools. Customise your app with any combination of our built-in features. Provide contact details, directions, social links and your opening hours from one easy to access tab. 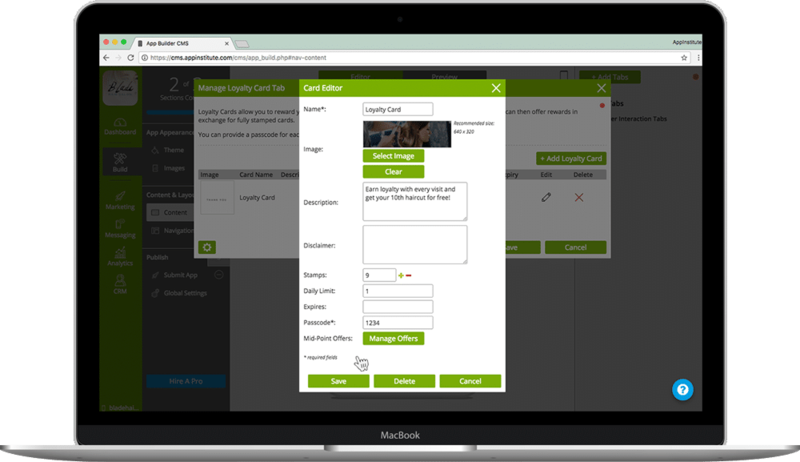 Communicate directly with individual app users with your own secure chat centre and send attachments. 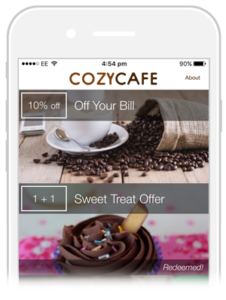 Drive sales and incentivise app downloads with redeemable coupons with set start and expiry dates. Customise your own stamp card and even create midpoint offers to keep your customers coming back. 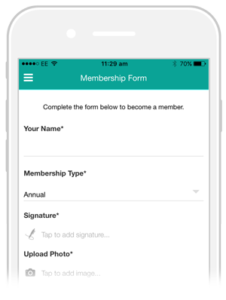 Create a form for anything with features like photo upload, text and signature fields. Perfect for Takeaways and Restaurants. 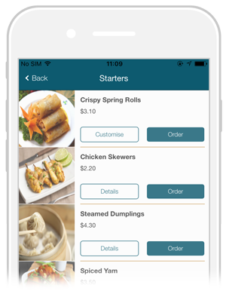 Offer food ordering services from your own branded app. Promote your services, product or portfolio and allow users to rate your photos. 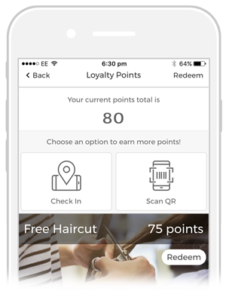 Let customers earn points to redeem again rewards by checking into your business or scanning a QR code. Add text, upload images, embed videos or use custom HTML to create unlimited pages of content. The next generation of app technology. 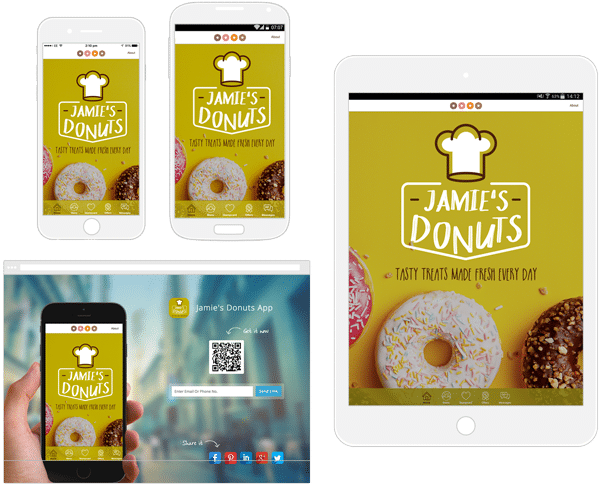 Connect with your customers instantly on any smartphone and tablet device and offer the best in mobile user experience to drive sales, encourage loyalty and improve communications. 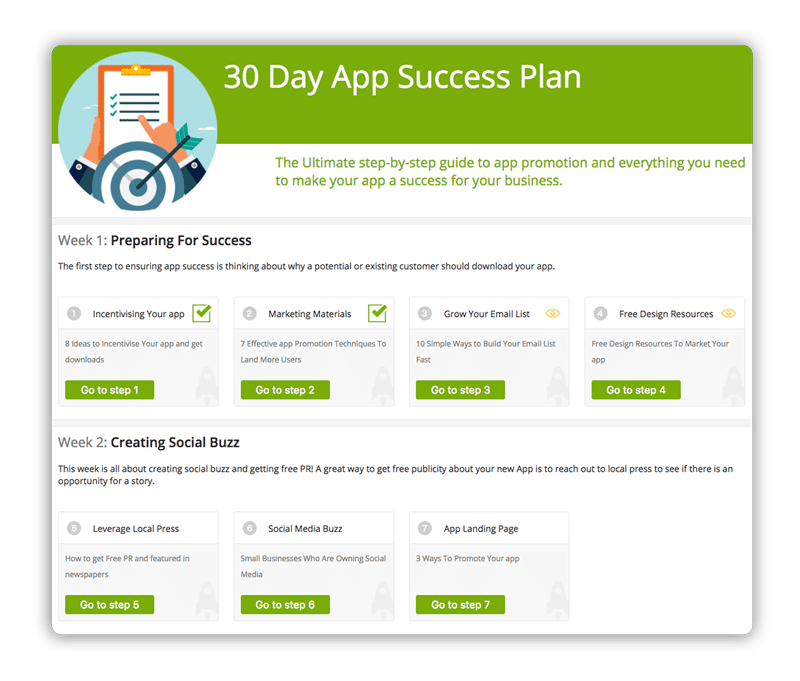 See how easy it is to make an app for your business. Take total control over your app’s appearance with custom colour schemes, images, logos, layouts, menu styles and fonts. All the tools and resources to ensure your app’s long-term success. 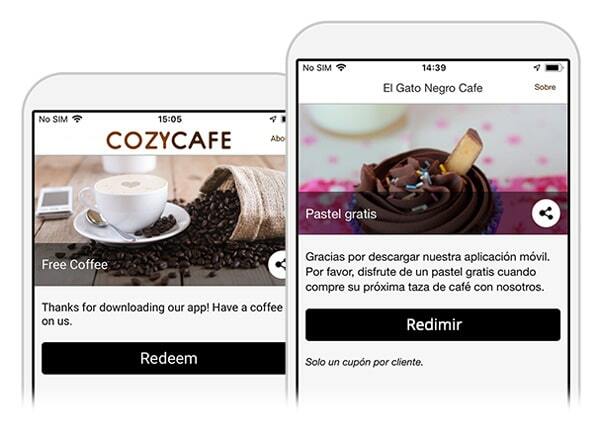 From a promo app website, QR code generator, social sharing tools to a 30-day success guide – we provide all the essential resources you need to effectively launch, promote and market your app. Measure your app success with our built-in analytics tool to track app downloads by device and country or view how many active users you have. You can even connect to Google Analytics for more advanced insights and reporting functionality. Push is the most effective way to communicate with your customers. 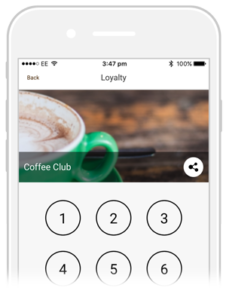 Send messages directly to your customer’s phone screen and promote exclusive offers and sales, events, company updates or news. 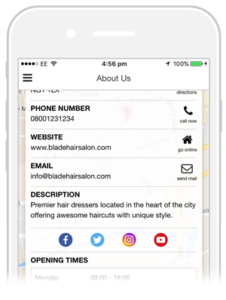 Target your app users based on their location or proximity to your business or competitors using our advanced geo-fencing feature. 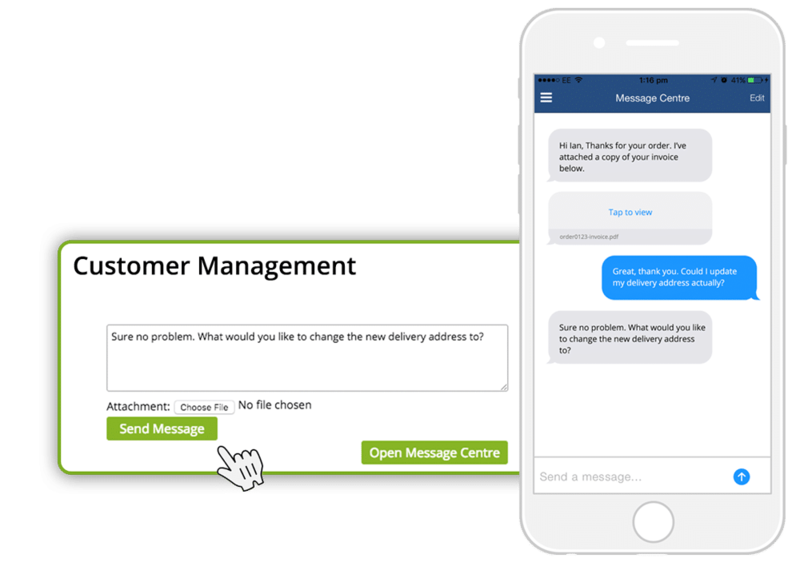 Respond directly to private chat messages and provide an easy way for customers to stay connected with your business 24/7. 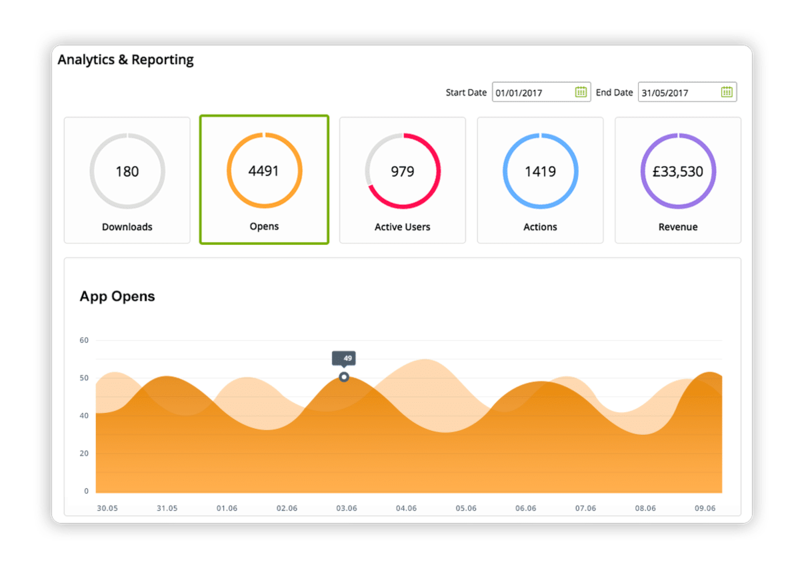 Keep track of your customer’s app interactions and sales history and group multiple customers using tags for targeted campaigns. Connect with your customers wherever you are, with our multi-language features. 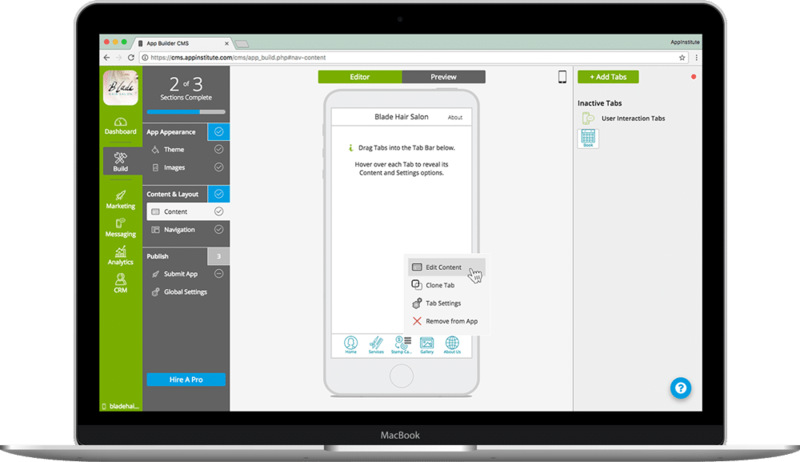 Start building your app for free – no credit card needed. 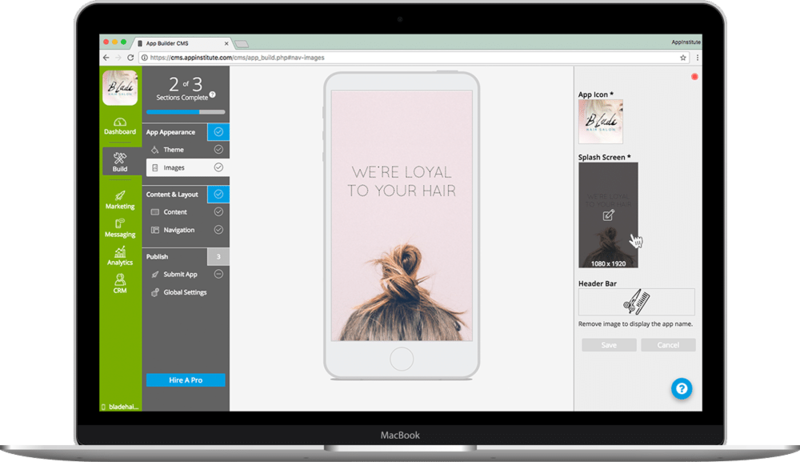 With our drag and drop, click to edit app builder platform, we make it easy for anyone to create, customise and manage their app without the need for any coding. We’ll provide you with all the resources you need to market your app to your customers. 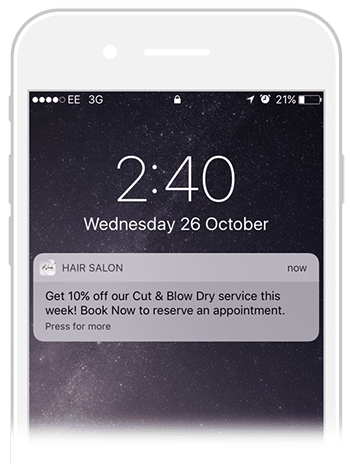 Use Push Notifications to send messages directly to your clients phone to promote special offers, sales and new products! Customise your app to look the way you want it. Add your logo and company colors, improve your brand recognition. Google list content from mobile apps higher up in search results when displayed on a mobile device! 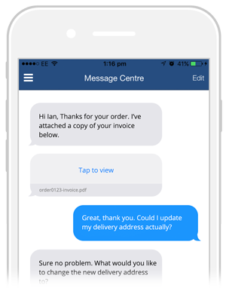 Manage your business from your phone with our CRM App; view app sales, send Push Notifications or view analytics. Pay month to month and cancel any time. Change your price plan depending on your needs and growth. 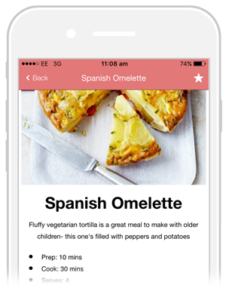 Use content from your Facebook Page or choose from a selection of professionally designed templates to create your app in just a few clicks.